The colorful and chaotic frenzy that is India can quickly frazzle even the most seasoned travel vet. Happily, remedies to recover from India’s assault on the senses are well within reach in a nation that’s served as a fountainhead for such ancient wellness traditions for as yoga, Ayurveda, and meditation. I survived my recent month on the road there by setting aside some much-needed downtime at a handful of the country’s superlative spa hotels. Put R&R on your radar at two splurge-worthy mountain spa oases, where the resorts are worthy destinations in and of themselves, or try two great-value hub-city hotels touting top-notch spas aimed at helping you reboot while you’re en route. The Digs: Be pampered from this prime perch in the serene Himalayan foothills, where the 75-room resort overlooks lush forests, the Ganges River, and the meditation/yoga mecca at Rishikesh, delivering delectable organic cuisine, a daily schedule of wellness-centered activities, and diversions like a heated outdoor swimming pool and fitness center. The Spa: Ananda’s 24,000-square-foot spa anchors the resort with an extensive variety of ancient and contemporary treatments, from Ayurveda to Swedish to Thai, all helmed by a staff of top-rate spa therapists and yoga and philosophy masters. The Best-Value Treatment: Pair the 30-minute “Ananda Touch” massage ($36) with a 45-minute “Ginger & Lemon Grass Salt Scrub” ($44). The Cost: Rooms start from $345/night per person (based on double occupancy) including daily yoga and meditation classes. Book a three-night “Himalayan Bliss” package for $510/night per person (double occupancy) and get daily breakfast and dinner, ground transfers, and select spa experiences. The Spa: At 20,000 square feet, the three-level R The Spa is one of the most spacious in Delhi, combining a menu of Asian- and Western-inspired treatments in rooms outfitted with anti-gravity aqua beds, hammam tables, or Vichy showers. The Best-Value Treatment: Book the 60-minute “Indian Marma Energy Massage,” incorporating traditional Ayurvedic energy points ($54). Or, try the “Spa Transit Package,” including massage, facial, herbal bath, and more (four hours from $122). The Cost: Room rates start from $210/night (double occupancy), including buffet breakfast, Wi-Fi, and airport transfers; book early and save 25 percent. The Digs: Part of the prestigious Oberoi brand, this sparkling spa resort surveys snow-capped Himalayan peaks and forest-blanketed valleys, primed for encounters with the great outdoors. Old-world-style opulence spills over from the plush chandelier-crowned public spaces (including two restaurants, a bar, mosaic tiled indoor pool, and outdoor Jacuzzi) to the 87 well-appointed rooms. Plus, find a fitness center, daily yoga classes, tennis (in summer), and ice skating (in winter). The Spa: Wildflower Hall’s spa draws on some 5,000 years of wellness rituals sourced from Ayurvedic, Oriental, and Western traditions. Take a treatment in the hotel’s spa suites or adjacent spa pavilion, touting forest and mountain views. The Best-Value Treatment: Try the 90-minute “Journey to Tibet” package combining a warm herbal poultice massage with chakra balancing ($151). The Cost: For stays through March, book the two-night “Wellness in the Himalayas” package from $231/night (double occupancy) with daily breakfast, a comped second room for the kids, and 15 percent off spa therapies. The Digs: This hip 95-room hotel debuted in March as a welcomed oasis in the heart of Mumbai’s hubbub (just a five-minute drive from the airport). Themed guestrooms come with contemporary design schemes borrowed from nature ("Glacier," "Fire," etc. ), and several restaurants and bars, including a grill with a Miami-esque outdoor lounge. Next door, the members-only Waterstones Club is open free to hotel guests, with a fitness center, expansive swimming pool, steam room, sauna, tennis courts, and more. The Spa: Bliss – The Spa offers a quartet of treatment rooms doling out eclectic treatment options like Balinese, Swedish, and aromatherapy massages, along with scrubs, wraps, and facials. 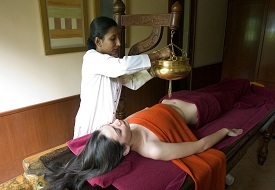 The Best-Value Treatment: Try the 60-minute “Abhyanga” massage, utilizing Ayurvedic oils, for $56. The Cost: Rates start from $155/night (double occupancy); upgrade to an Executive Room (from $191/night) and get daily buffet breakfast, Wi-Fi, and airport transfers, too. (Tip: Book early and save 20 percent).